As I’ve mentioned before, I have been riding my bicycle for my work commute. I don’t use bike gloves since the ones I have used before didn’t really do much in terms of keeping my hands warm. They were more for padding than anything else. But that was over 10 years ago. I don’t know how things have changed since then. 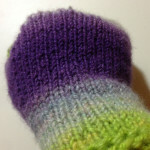 However, I have been using my handspun fingerless gloves. They work well unless it is really cold or windy. Sometime in December, I lost them. I have no idea where they are. I guess I should check lost and found at work. In the meantime, the other pair that I had made had also gone MIA. I have absolutely no idea how I could have lost 2 pairs of fingerless mitts when I need them the most. For now, I am wearing a pair of wind block fleece gloves. They are actually working quite well, but there are times when it’s too mild for them. Besides, I miss my fingertips. I use my fingertips to adjust zippers, hats/ear warmers, earbuds and control my phone (volume and playback). To do that with the fleece gloves, I have to pull over to the side, take the glove off, do what needs to be done, and pull it back on before continuing on my merry way. The gloves are just too bulky. 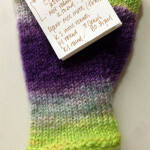 So, I decided to knit another pair for bicycling. These will be dedicated biking mitts so I took a hard look at what worked well and what could be improved with the pair I lost. Then I winged the rest, designing as I went. This time around, I didn’t assume that I will remember from one mitt to the other and took copious notes. Not only that, I took notes on something other than the back of an envelope that might accidentally be tossed into the recycling bin. Wish me luck on the second mitt!